Egmont Prinz zur Lippe-Weißenfeld (14 July 1918 – 12 March 1944) was a Luftwaffe Nightfighter ace of aristocratic descent during World War II. The reason I will give attention to this pilot is the fact that he was one of the most credited Ace with 51 aerial victories, all of them claimed in nocturnal combat missions. Many of them over Dutch territory. Even more important is the fact that 5 of his “victories” are present at our museum. So the thin line between his success and the personal loss of the enemy is for me very clear. Egmont Prinz zur Lippe-Weißenfeld was born on 14 July 1918 in Salzburg, Austria as a member of a cadet line of the aristocratic House of Lippe. His father was Prinz Alfred zur Lippe-Weißenfeld and his mother Anna Weißenfeld, born Countess Goëß. The family lived in an old castle in Upper Austria called Alt Wartenburg. At birth he had a remote chance of succeeding to the throne of the Principality of Lippe, a very small state within the German Empire. However, only months after his birth, Germany became a Republic and all the German royal houses were forced to abdicate. He joined the infantry of the Austrian Bundesheer (army) in 1936. He transferred to the emerging Luftwaffe, initially serving as a reconnaissance pilot in the Zerstörergeschwader 76 (ZG 76), before he transferred to the night fighter force. He claimed his first aerial victory on the night of 16 to 17 November 1940. By the end of March, he had accumulated 21 aerial victories for which he was awarded the Knight’s Cross of the Iron Cross (Ritterkreuz des Eisernen Kreuzes) on 16 April 1942. He received the Knight’s Cross of the Iron Cross with Oak Leaves (Ritterkreuz des Eisernen Kreuzes mit Eichenlaub) on 2 August 1943, for 45 aerial victories. He was promoted to Major and tasked with leading Nachtjagdgeschwader 5 (NJG 5) in January 1944, before he and his crew were killed in a flight accident on 12 March 1944. His Luftwaffe career started with the II. Gruppe (2nd group) of the Zerstörergeschwader 76 (ZG 76) before he was transferred to the night fighter wing Nachtjagdgeschwader 1 (NJG 1) on 4 August 1940. The unit was based at Gütersloh where he familiarised himself with the methods of the night fighters. By the summer of 1940, the first night fighters were transferred to Leeuwarden in the Netherlands. Prinz zur Lippe-Weißenfeld was one of the pilots included in this small detachment. As early as 20 October 1940, he had taken over command of an independent night fighter commando at Schiphol and later at Bergen. On his first encounter with the Royal Air Force (RAF) bomber, in the night of 16 to 17 November 1940, he claimed a Vickers Wellington bomber from No. 115 Squadron RAF shot down at 0205 hours. His second victory was claimed on the night of 15 January 1941, when he shot down an Armstrong Whitworth Whitley N1521 of the Linton-on-Ouse based No. 58 Squadron RAF over northern Holland, near the Dutch coast in the Zwanenwater at a nature reserve at Callantsoog. The remains of this plane are today present in our museum. He was wounded in action on 13 March 1941, while flying Bf 110 D-2 (W.Nr. 3376 — factory number) of the 4./NJG1 with his radio operator Josef Renette when he made an emergency landing at Bergen after their aircraft was hit by the defence fire, wounding them both. 13 Shortly after midnight on 10 April 1941, Prinz zur Lippe-Weißenfeld claimed a No. 12 Squadron RAF Wellington over the IJsselmeer, raising NJG 1’s victory score to 100. This achievement was celebrated at the Amstel Hotel in Amsterdam with General Josef Kammhuber, Wolfgang Falck, Werner Streib, Helmut Lent and others attending. On 30 June 1941 while flying Bf 110 C-4 (W.Nr. 3273) on a practice intercept mission over Noord Holland, he collided with Bf 110 C-7 (W.Nr. 2075) piloted by Leutnant Rudolf Schoenert of the 4./NJG 1 and crashed near Bergen aan Zee. By July 1941 his number of aerial victory claims stood at 10. Promoted to Oberleutnant he became Staffelkapitän of the 5th Staffel of Nachtjagdgeschwader 2 (NJG 2) on 15 November 1941. By the end of 1941 he had claimed a total of 15 aerial victories. He was awarded the German Cross in Gold (Deutsches Kreuz in Gold) on 25 January 1942 and the Knight’s Cross of the Iron Cross (Ritterkreuz des Eisernen Kreuzes) on 16 April 1942 after he had shot down 4 RAF bombers in the night of 26 to 27 March 1942, his score standing at 21 aerial victories.. In July 1942 he was one of the leading German night fighter aces with 37 aerial victories. 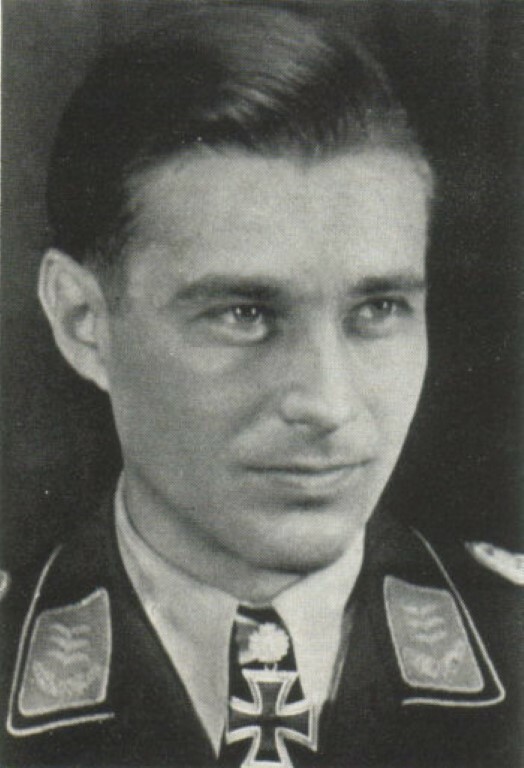 Promoted to Hauptmann, Prinz zur Lippe-Weißenfeld was made Gruppenkommandeur of the I. Gruppe (1st group) of Nachtjagdgeschwader 3 on 1 October 1942, where he claimed 3 further aerial victories. He was transferred again, taking command of the III. Gruppe (3rd group) of NJG 1 on 31 May 1943. One month later he claimed his 45th aerial victory for which he was awarded the Knight’s Cross of the Iron Cross with Oak Leaves (Ritterkreuz des Eisernen Kreuzes mit Eichenlaub) on 2 August 1943. After a one month hospital stay, Prinz zur Lippe-Weißenfeld was promoted to Major and made Geschwaderkommodore of Nachtjagdgeschwader 5 (NJG 5) on 20 February 1944. He and his crew, Oberfeldwebel Josef Renette and Unteroffizier Kurt Röber, were killed in a flying accident on 12 March 1944 on a routine flight from Parchim to Athies- sous-Laon. Above Belgium, they seem to have encountered a bad weather zone with low clouds and a dense snowstorm and it was assumed that the aircraft hit the high Ardennes ground after being forced to fly lower because of ice forming on the wings. The exact circumstances of this flight may never be known, the Bf 110 G-4 C9+CD (Werknummer 720 010—factory number) crashed into the Ardennes mountains near St. Hubert where the completely burned-out wreck was found the following day The funeral service was held in the city church of Linz on 15 March 1944. 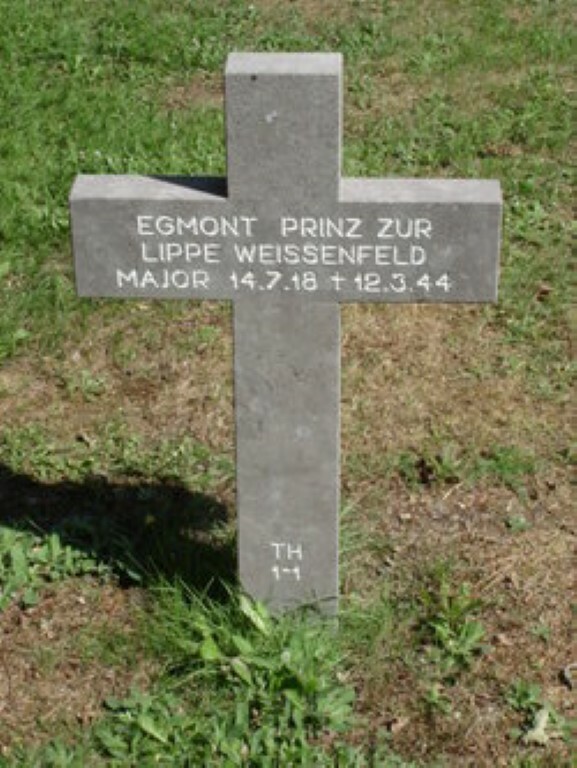 Prinz Egmont zur Lippe- Weißenfeld and Prinz Heinrich zu Sayn-Wittgenstein are buried side by side at Ysselsteyn in the Netherlands. Remark: We have contact with 2 still living sisters of Prince Egmont. More information will follow. Prinz zur Lippe-Weißenfeld was born on 14 July 1918 in Salzburg, Austria and joined the infantry of the Austrian Bundesheer in 1936. He transferred to the emerging Luftwaffe, initially serving as a reconnaissance pilot in the Zerstörergeschwader 76 (ZG 76), before he transferred to the night fighter force. He claimed his first aerial victory on the night of 16 to 17 November 1940. By the end of March, he had accumulated 21 aerial victories for which he was awarded the Knight’s Cross of the Iron Cross (Ritterkreuz des Eisernen Kreuzes) on 16 April 1942. He received the Knight’s Cross of the Iron Cross with Oak Leaves (Ritterkreuz des Eisernen Kreuzes mit Eichenlaub) on 2 August 1943, for 45 aerial victories. He was promoted to Major and tasked with leading Nachtjagdgeschwader 5 (NJG 5) in January 1944, before he and his crew were killed in a flight accident on 12 March 1944. 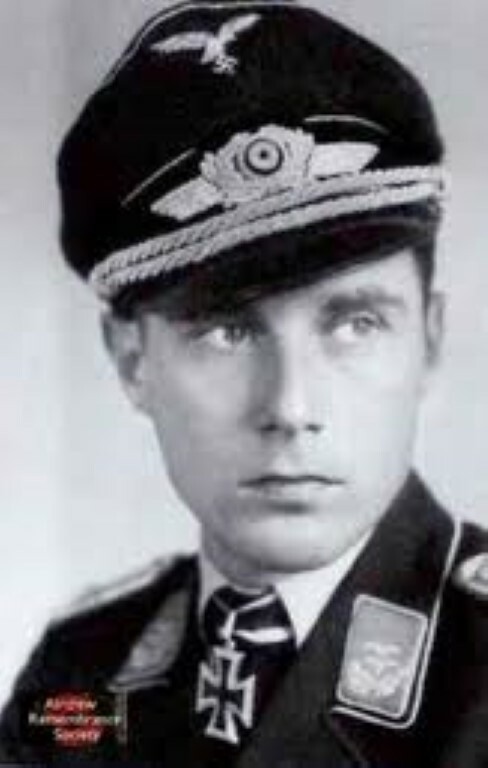 Egmont Prinz[Notes 3] or zur Lippe-Weißenfeld was born on 14 July 1918 in Salzburg, Austria as a member of a cadet line of the aristocratic House of Lippe. His father was Prinz Alfred zur Lippe-Weißenfeld and his mother Anna Weißenfeld, née Countess Goëß. Egmont was the only son of four children. His sisters Carola, Sophie and Dora were all younger than Egmont. The family lived in an old castle in Upper Austria called Alt Wartenburg. At birth he had a remote chance of succeeding to the throne of the Principality of Lippe, a very small state within the German Empire. However, only months after his birth, Germany became a Republic and all the German royal houses were forced to abdicate. Prinz zur Lippe-Weißenfeld in his younger years was very enthusiastic about the mountains and wildlife. From his fourteenth year he participated in hunting. At the same time he was also very much interested in music and sports and discovered his love for flying at the Gaisberg near Salzburg. Here he attended the glider flying school of the Austrian Aëro Club. He attended a basic flying course with the second air regiment in Graz and Wiener Neustadt even before he joined the military service. Prinz zur Lippe-Weißenfeld never married or had children. In January 1941 he became acquainted with Hannelore Ide, nicknamed Idelein. She was a secretary for a Luftgau. The two shared a close relationship and spent as much time together as the war permitted, listening to music and sailing on the IJsselmeer until his death in 1944. Prinz zur Lippe-Weißenfeld joined the Austrian Bundesheer in 1936 at the age of 18, initially serving in the infantry. In the aftermaths of the 1938 Anschluss, the incorporation of Austria into Greater Germany by Nazi Germany, he transferred to the German Luftwaffe and was promoted to Leutnant in 1939. He had earned his Luftwaffe Pilots Badge on 5 October 1938 and underwent further training at Fürstenfeldbruck, Schleißheim and Vienna-Aspern. His Luftwaffe career started with the II. Gruppe (2nd group) of the Zerstörergeschwader 76 (ZG 76) before he was transferred to the night fighter wing Nachtjagdgeschwader 1 (NJG 1) on 4 August 1940. [Notes 4] The unit was based at Gütersloh where he familiarised himself with the methods of the night fighters. By the summer of 1940, the first night fighters were transferred to Leeuwarden in the Netherlands. Prinz zur Lippe-Weißenfeld was one of the pilots included in this small detachment. As early as 20 October 1940, he had taken over command of an independent night fighter commando at Schiphol and later at Bergen. On his first encounter with the Royal Air Force (RAF) bomber, in the night of 16 to 17 November 1940, he claimed a Vickers Wellington bomber from No. 115 Squadron RAF shot down at 0205 hours. His second victory was claimed on the night of 15 January 1941, when he shot down an Armstrong Whitworth Whitley N1521 of the Linton-on-Ouse based No. 58 Squadron RAF over northern Holland, near the Dutch coast in the Zwanenwater at a nature reserve at Callantsoog. He was wounded in action on 13 March 1941, while flying Bf 110 D-2 (W.Nr. 3376 — factory number) of the 4./NJG1 with his radio operator Josef Renette when he made an emergency landing at Bergen after their aircraft was hit by the defence fire, wounding them both. Shortly after midnight on 10 April 1941, Prinz zur Lippe-Weißenfeld claimed a No. 12 Squadron RAF Wellington over the IJsselmeer, raising NJG 1’s victory score to 100. This achievement was celebrated at the Amstel Hotel in Amsterdam with General Josef Kammhuber, Wolfgang Falck, Werner Streib, Helmut Lent and others attending. On 30 June 1941 while flying Bf 110 C-4 (W.Nr. 3273) on a practice intercept mission over Noord Holland, he collided with Bf 110 C-7 (W.Nr. 2075) piloted by Leutnant Rudolf Schoenert of the 4./NJG 1 and crashed near Bergen aan Zee. On 19 June 1941 he earned his first of four references in the daily Wehrmachtbericht, a daily radio report made by the Oberkommando der Wehrmacht (High Command of the Armed Forces) regarding the military situation on all fronts. By July 1941 his number of aerial victory claims stood at 10. Promoted to Oberleutnant he became Staffelkapitän of the 5th Staffel of Nachtjagdgeschwader 2 (NJG 2) on 15 November 1941. By the end of 1941 he had claimed a total of 15 aerial victories. He was awarded the German Cross in Gold (Deutsches Kreuz in Gold) on 25 January 1942 and the Knight’s Cross of the Iron Cross (Ritterkreuz des Eisernen Kreuzes) on 16 April 1942 after he had shot down 4 RAF bombers in the night of 26 to 27 March 1942, his score standing at 21 aerial victories. This feat earned him his third reference in the Wehrmachtbericht on 27 March 1942. In July 1942 he was one of the leading German night fighter aces with 37 aerial victories. After a one month hospital stay, Prinz zur Lippe-Weißenfeld was promoted to Major and made Geschwaderkommodore of Nachtjagdgeschwader 5 (NJG 5) on 20 February 1944. He and his crew, Oberfeldwebel Josef Renette and Unteroffizier Kurt Röber, were killed in a flying accident on 12 March 1944 on a routine flight from Parchim to Athies-sous-Laon. Above Belgium, they seem to have encountered a bad weather zone with low clouds and a dense snowstorm and it was assumed that the aircraft hit the high Ardennes ground after being forced to fly lower because of ice forming on the wings. The exact circumstances of this flight may never be known, the Bf 110 G-4 C9+CD (Werknummer 720 010—factory number) crashed into the Ardennes mountains near St. Hubert where the completely burned-out wreck was found the following day. The funeral service was held in the city church of Linz on 15 March 1944. 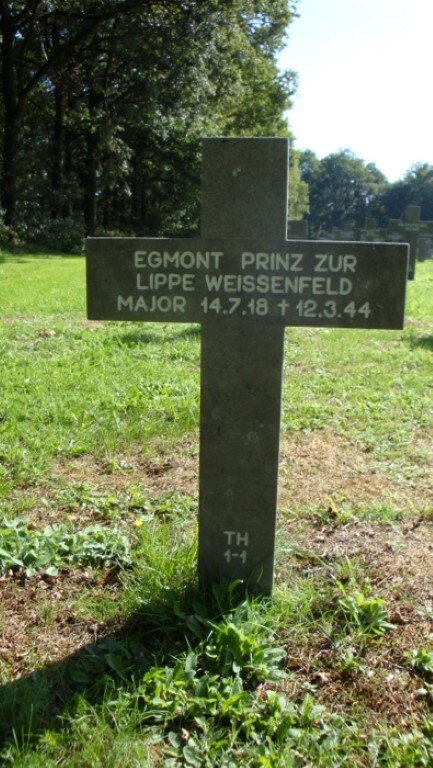 Prinz Egmont zur Lippe-Weißenfeld and Prinz Heinrich zu Sayn-Wittgenstein are buried side by side at Ysselsteyn in the Netherlands. “Princes of Darkness” is a unique illustrated account of the careers of the two `fighting princes` of the Luftwaffe`s night fighter force, Heinrich Prince zu Sayn-Wittgenstein and Egmont Prince zur Lippe-Weissenfeld, whose lives were often inter-connected. This book is the result of many years research on the part of its author, Claire Rose Knott, who has been granted unprecedented access by the princes` respective families to never before published diary notes, personal correspondence, logbooks, and family photographs. The work also benefits from research in archival resources, technical data and recollections supplied by the Princes` night fighter contemporaries. The text contains first-hand accounts by family, friends and fellow officers who offer unique accounts of the ambition, intensity and actions of the leading characters in time of war. The Princes have courted controversy with several conspiracy theories abounding regarding their deaths.The plausibility of such theories when viewed against their aristocratic family backgrounds and placed against the backdrop of intense social upheaval under the Nazi regime, merit investigation. 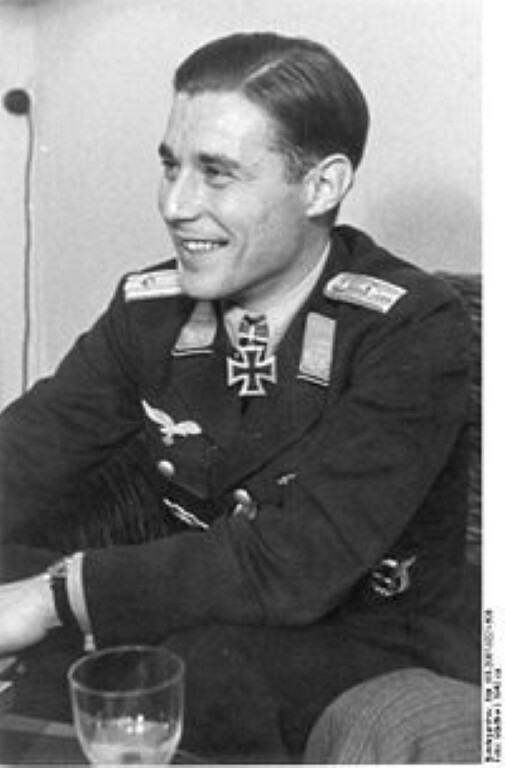 Prince Heinrich Zu Sayn-Wittgenstein was the third highest scoring night fighter ace in the Luftwaffe. Serving from mid-1941 until his death in 1944. He was killed on 21 January while Kommodore of NJG 2, after shooting down four RAF bombers, when his aircraft was hit by return fire from a bomber or by an RAF nightfighter. Zu Sayn-Wittgenstein baled out but was killed by the impact of landing. His victory score at that time of his death was 83 – 29 in the East and 54 in the West. Prince Egmont zur Lippe-Weissenfeld, an Austrian, started his career as a daylight fighter pilot flying `heavy` fighters with II./ZG 76. He became a nightfighter when serving under the famous Helmut Lent as Staffelkapitan of 5./NJG 2 in November 1941.He is accredited with 51 aerial victories while flying – mainly the Messerschmitt Bf 110 – with NJG 1 and NJG 5 and is ranked 21st among the German night fighter aces. He was killed while with the Stabsschswarm of NJG 5 on 3 March 1944 when his Bf 110 clipped the ground and crashed during a flight over the Ardennes. The text is supported by rare and fascinating photographs of the pilots` aircraft, weaponry (including the upward-firing `Jazz Music` twin cannon) and radar equipment as well as others in their squadrons, together with commissioned colour artwork of Messerschmitt Bf 110 and Junkers Ju 88 night fighters.